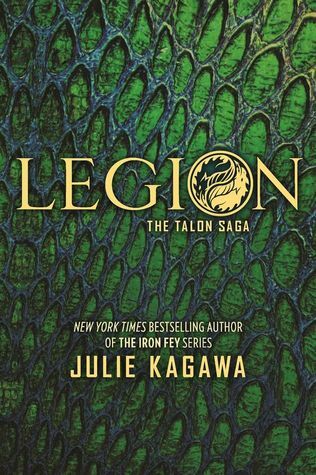 Legion by Julie Kagawa is the fourth installment in the author’s fantastic Talon paranormal urban fantasy series featuring dragons and dragon slayers. OMG a hundred times over! The story is action-packed, fast-paced, emotional, gripping, shocking, exciting perfection! It is thrilling to the point of being heart-stopping. As in the previous books, Legion is told from the multiple points-of-view of the primary characters allowing readers to become one with the thoughts of each. This is a series that absolutely must be read in order. There’s been so much character and relationship development and detailed build-up for the grand finale that anyone jumping into the series out-of-order would either be lost or not appreciate the exquisiteness of the Talon Saga. Do yourself a huge favor and enjoy this series in order. You won’t regret it! Thankfully, the love triangle that encompassed the first three books has been mostly resolved. Ember has made her choice. The Talon organization is horrible and Dante, Ember’s brother, has been wholly brain-washed by his absolute need to be in control. His allegiance is to the order … period. Will Ember survive? AND, IF she does, will she write her brother off as a lost cause? One thing is for sure. The two dragon twins have drastically opposite moral compasses and sacrifices will unquestionably need to be made. “If I was in Talon, I would be the one in charge, I'd be the one calling the shots. I wouldn't have to take pointless exams, listen to humans or worry that my every move was being watched. In Talon, dragons were the bosses, the presidents, the CEOs. If I was a part of the organization, no one would tell me what to do ever again. I listened to the audio edition as I have with all of the prior books. I cannot imagine doing anything other than listening to this series as the audios have undeniably enhanced my enjoyment of the series bringing Julie’s amazing story to life. The series started out with three narrators. Tristan joined the original three for the second book. The resulting foursome have been together for the last three books. I really like the multiple narrators for this series. They mesh seamlessly and it is a natural discernment between which character is speaking at any one time. Just know that this tale is an extraordinary stomach-clencher! I actually had to stop the audio numerous times solely to remind myself to breathe. This series gets better with every book and, since every book has been a five star read for me, that’s more than awesome! I love, love, love this series and can’t wait for the finale! While Legion ends with a bit of a cliffhanger as war IS coming, it’s not the type of cliffhanger that is gut-wrenching as Soldier’s was. Thank you, Julie! The concluding book, Legion, features blood red scales on the cover and releases Spring 2018. This series would decidedly equate to a phenomenal movie experience on the big screen. Keeping my fingers crossed that happens! Inferno (Book #5) - Expected publication Spring 2018!